Just over a hundred years ago, through the now distant World War I, the world came to terms with the phenomenon of massive waves of refugees: people fleeing war and looking for refuge in a neighbouring country. Today – in a Europe of the euro, a Europe of rights, a united Europe – a certain sense of shame exists with respect to the situation of Syrian refugees fleeing a conflict that has gone on for more than five years and decimated an entire country. How strange it is that they are called “refugees”, given they do not get the “refuge” they demand. In contrast to what is happening in the Europe of the euro, the Europe of rights is one that does not open its doors to those people trying to escape the horrors of war. What is even stranger is that when I see columns of refugees walking through a European Union which is void of solidarity, it makes me think of the Romani people, a people who are no longer nomadic yet who must settle for living as second-class citizens in most European countries. Perhaps we European Roma have paid and continue to pay for our “refugee” status in Europe with the currencies of marginalisation and segregation. And the unfortunate lack of solidarity towards refugees on the part of European states is nothing new if we look back to the way thousands died in the concentration camps that the French government set up for those fleeing the Spanish civil war, or how the UN behaved during the Yugoslav Wars of the 1990s, an issue that has not been settled to this very day. The list of examples of European apathy is a long one. But I also think that some European states would be richly nourished by these refugees, amongst them Spain. As a demonstration of servility towards its central government, Spain has the dubious distinction of being the country that has taken in the lowest number of refugees, while also and paradoxically being the country that needs them the most. Why? It turns out that Spain was once the country with the world’s lowest birth rate. In the 1980s, its women of childbearing age had the fewest children, and twenty-five years on we find ourselves with an enormous population of aging citizens. Syrian refugees would bring educated and qualified people to the table, as it had been a country where it was possible to study and get an education. They would also help us replenish the vitality that our country now sorely lacks. The arrival of educated people would make a timely albeit minimal contribution to our demographic index. As ignorance and prejudice are the original sins of states, newcomers have always been seen as a problem. We should understand that human beings are naturally nomadic and ask ourselves why we subject ourselves to the fictional tales told by countries. Possibly out of self-interest. Hunger and need are what make us move. It is in our genes, in our nature. The human being is the mammal that expends the least energy when moving from one place to another. Roma arrived to Western Europe between the 13th and 14th centuries and, despite being initially well received by the kingdoms and duchies that granted them “refuge”, it only took them a few years to start creating laws against them. Roma represented an alternative way of living to that of feudal Europe, one where people lived in small communities and traded and exchanged goods with stable populations. In a Western world that would later give birth to absolutist monarchies, this was a provocation. We could talk about the example of what happened to the Travellers in Ireland. In spite of the chronological distance between them, today’s Syrian refugees share many similarities with the Romani people. The first is that of having fled their country of origin. In the case of the Romani people, the reason for this is a mystery, but experts say it could have been because of a war or due to social or religious conflicts. Both peoples suffered from a wide range of calamities as they made their way through Europe, owing to the laws of its states (bearing in mind that Angela Merkel’s “united Europe” spent two billion euros to protect the borders of its economic community). And both peoples continue to suffer. We only have to recall the expulsions of Roma thrown out by Sarkozy in France or those that occurred a few years ago in Italy. 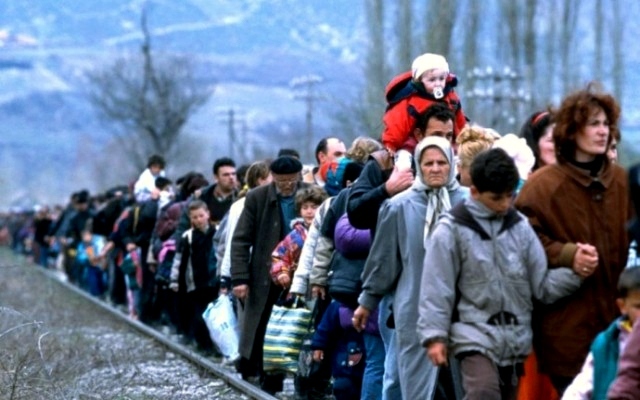 Another case in point would be the recent expulsion of Roma of Kosovar origin from Germany. These are individuals who, in spite of having been born in Germany, were sent away to Kosovo, which made absolutely no sense at all. As for the Syrian people, we only need to look at a newspaper to witness the continued expulsions and barriers they face on a daily basis. Both peoples have an ancient, rich and complex cultural background that has enriched the European cultural milieu. To illustrate this point, we only have to recall that when Roma arrived to Europe they knew how to measure the distance between Middle Eastern cities and the moon; they were able to calculate the diameter of the Earth; they introduced new forms of metallurgy to their newfound continent; they were able to use bellows and enriched popular European folklore. Let us hope that our states will allow us to enrich our own lives by letting in more Syrian refugees.